Immunocytochemistry/Immunofluorescence: 58K Golgi Protein Antibody (58K-9) [NB600-412] - HeLa cells, cultured on cover slips, were fixed with 10% formalin for 10 minutes and then permeabilized for 5 minutes using 1X TBS + 0.5% Triton-X100. 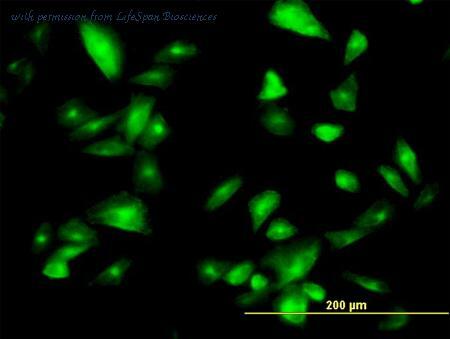 The cells were then incubated with 1:200 dilution of anti-58K Golgi Protein antibody (clone 58K-9) for overnight at 4C and detected with an anti-rabbit Dylight 488 (Green) secondary at a 1:500 dilution. Alpha tubulin (DM1A) [NB100-690] was used as a co-stain at a 1:1000 dilution and detected with an anti-mouse Dylight 550 (Red) at 1:500 dilution. Nuclei were counterstained with DAPI solution (Blue) [NBP2-31156]. Cells were imaged using a 40X objective. Antibody clone 58K-9 generated a specific signal in the Golgi apparatus of the cells. 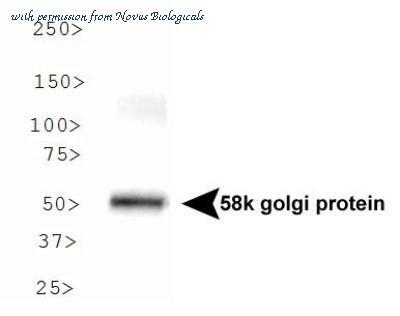 Western Blot: 58K Golgi Protein Antibody (58K-9) [NB600-412] - Analysis of 58K golgi protein expression in rat liver tissue using NB600-412. 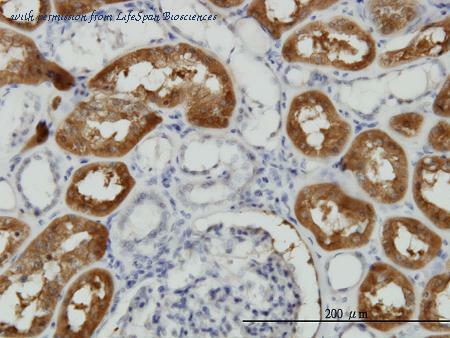 Immunohistochemistry: 58K Golgi Protein Antibody (58K-9) [NB600-412] - Analysis of 58K Golgi Protein in mouse kidney using DAB with hematoxylin counterstain. 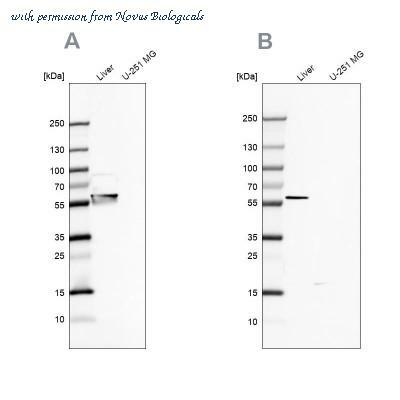 Western Blot: 58K Golgi Protein Antibody [NBP2-48601] - Analysis using Anti-FTCD antibody NBP2-48601 (A) shows similar pattern to independent antibody NBP2-48600 (B). 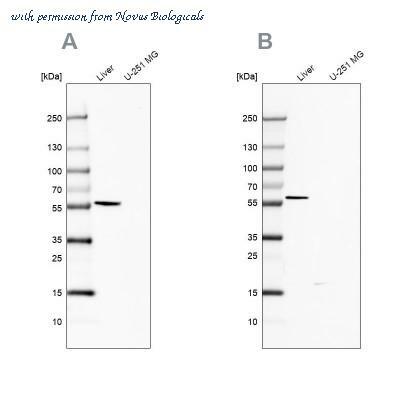 Western Blot: 58K Golgi Protein Antibody [NBP2-48651] - Analysis using Anti-FTCD antibody NBP2-48651 (A) shows similar pattern to independent antibody NBP2-48600 (B). 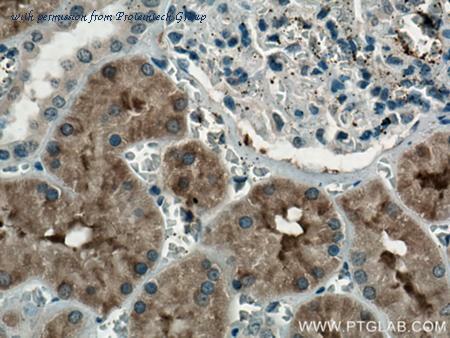 The FTCD antibody from Proteintech is a rabbit polyclonal antibody to a fusion protein of human FTCD. This antibody recognizes human,mouse,rat antigen. 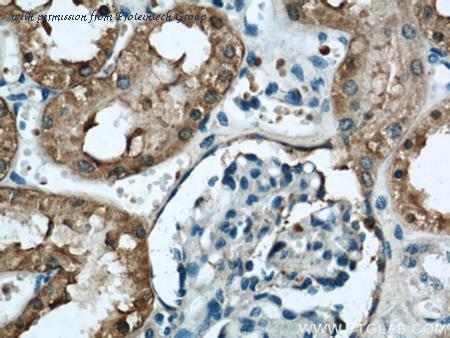 The FTCD antibody has been validated for the following applications: ELISA, WB, IHC analysis. The FTCD antibody from Proteintech is a mouse monoclonal antibody to a recombinant protein of human FTCD. This antibody recognizes human,mouse,rat,pig antigen. The FTCD antibody has been validated for the following applications: WB, ELISA analysis. Western blotting analysis of human liver lysate (35µg protein in RIPA buffer) using Goat anti Human FTCD antibody ( AHP1063 ) at 0.05 ugml -1 . Primary incubation was 1 hour. Signal was detected by chemiluminescence. 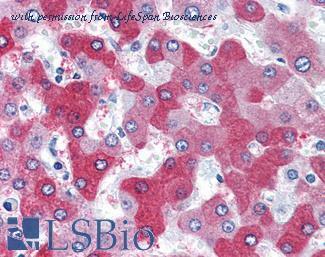 (0.03 ug/ml) Staining of Human Liver lysate (35 ug protein in RIPA buffer). Primary incubation was 1 hour. Detected by chemiluminescence. 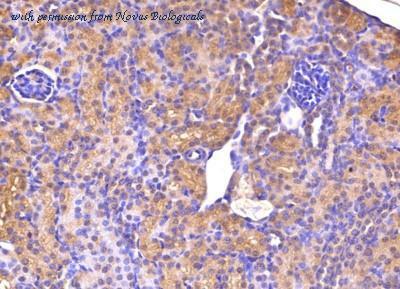 Anti-FTCD antibody IHC of human liver. Immunohistochemistry of formalin-fixed, paraffin-embedded tissue after heat-induced antigen retrieval. Antibody concentration 75 ug/ml. 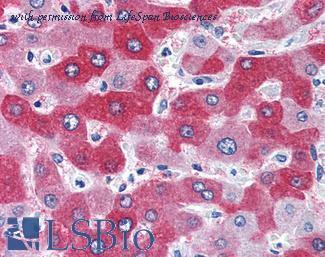 FTCD / 58K Golgi Protein antibody (0.1ug/ml) staining of Human Liver lysate (35ug protein in RIPA buffer). Detected by chemiluminescence. 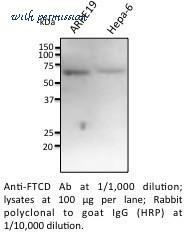 FTCD monoclonal antibody (M01), clone 3A4 Western blot of FTCD expression in HepG2.